I am very lucky. My new friend Joyce has agreed to give me cooking lessons. So many people here in Paris have raved about this tiny little lady's ability to whip up a delicious dinner party. She often prepares dishes for charity events and balls at the Heritage Manor (next door) so I certainly could not resist an opportunity to learn from her. We decided to begin with a few of her favorite and most requested creamy comfort dishes, perfect for a warm Sunday afternoon! I guess I am not surprised that we ended up serving five instead of just three. Now that I have tasted a few of her famous recipes I too will be dropping by around dinner time - just to see what she's making! I was thrilled to meet a few new friends and invited to tour two historical homes of our drop-in dinner guests. I am just kicking myself for being so eager and running out the door without my camera. I did snap a few shots on my iphone but it didn't do these homes justice. I am hoping for another invitation and from now on I vow not to leave my house with out a camera. Living in the historical district is making me oh, so happy today! 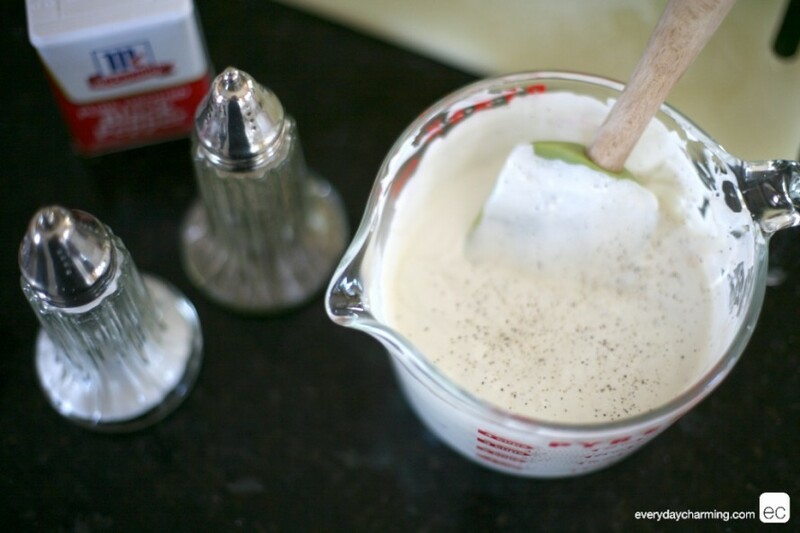 Begin by mixing 1 cup of Mayo. 1 cup of sour cream. I just noticed this is a light version... hmm, whatever makes you feel better - I really could not tell this was light so, if it makes you feel better - use it! One can of cream of mushroom soup. Salt and pepper to taste. I don't always know what this means so try 1 teaspoon salt and 1/4 teaspoon black pepper if you're still learning like me. Mix these items well and set aside to add later. Joyce actually had me use the potato peeler to remove the outer layer of each celery stalk. I have never seen this done before but I loved the way it removed the pesky strings and made each bite of crunch more enjoyable. Now its time to take out all of your aggression chopping the naked celery into small bites, you will want at least 2 cups. Side note** If you would like to cook your 4 chicken breasts ahead of time - go for it! Pull them out of the fridge and slice into small to medium sized chunks depending on your preference. Toss chicken, celery, almonds and a drained 8 oz. can of water chestnuts into a large mixing bowl. Not pictured... 4 oz of fresh sliced mushrooms - toss in! 3 hard boiled eggs sliced both ways. Joyce grabbed my camera and snapped a few shots... add an entire package of shredded cheddar cheese on top after spooning mixture into a 9x13 pan. Disregard the contents of this photo!! Bake at 350 degrees for 30 minutes. We both are too chatty and didn't notice until after I snapped the pic that the temp was too hot. I better stop asking about French Macaroons and pay attention! I snuck into the formal dining room to snap a few shots. Each room in Joyce's sprawling home is filled with beautiful antiques so naturally I was drooling all over. OK, back to our chicken salad. Slide the pan out of the oven to add 1 can of fried onion rings. Back into the oven for 15 more minutes. Adding a side of asparagus to our meal - yum! Whew! And that, my friends, was our first class. I typically am not a fan of casseroles but this one is so creamy and delicious, I will definitely be trying it again soon! P.S. e-mail me at laura@everydaycharming.com if you would like the printable recipe.